Hocus Pocus on DVD Just $4.99! You are here: Home / Great Deals / Amazon Deals / Hocus Pocus on DVD Just $4.99! Head over to Amazon and get Hocus Pocus on DVD for just $4.99! Shipping will be FREE with Amazon Prime or an order of $35 or more. You’re in for a devil of a time when three outlandishly wild witches — Bette Midler (BEACHES, BIG BUSINESS), Sarah Jessica Parker (HONEYMOON IN VEGAS), and Kathy Najimy (SISTER ACT) — return from 17th-century Salem after they’re accidentally conjured up by some unsuspecting pranksters! It’s a night full of zany fun and comic chaos once the tricky 300-year-old trio sets out to cast a spell on the town and reclaim their youth — but first they must get their act together and outwit three kids and a talking cat! 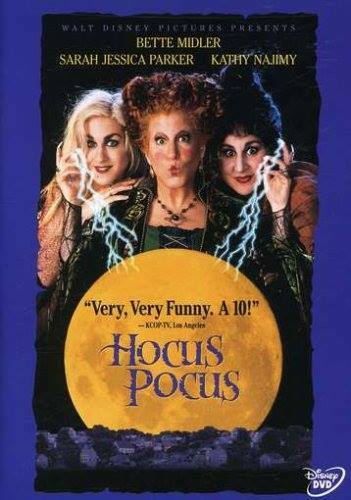 Loaded with bewitching laughs, HOCUS POCUS is an outrageously wild comedy that’s sure to entertain everyone!